The 4PGM four-roller crusher is used to bring the crushed material into the two pairs of rollers through the feeding port and is brought into the roller by the action of friction force to crush and crush the finished material from the lower tribe. When there is a hard or unbreakable object, the roller can be automatically retracted by the action of the hydraulic cylinder or the spring, so that the gap of the roller is increased, and the hard or unbreakable object is dropped, thereby protecting the machine from damage. Two pairs of oppositely rotating rollers have a certain gap, and the gap can be changed to control the maximum discharge size of the product. 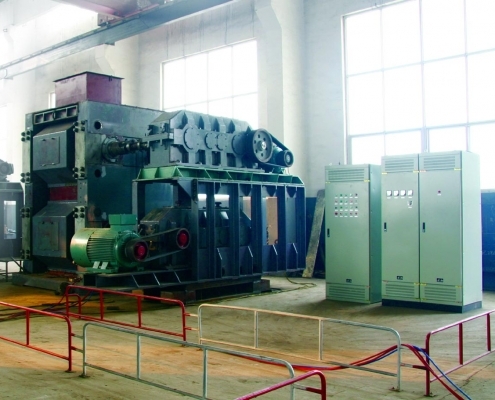 4PGM four-roller crusher is a new type of domestic 4PGM four-beam crusher developed on the basis of the old 4PG. It is actually composed of two double-roller crushers of the same specification. This model is suitable for medium and fine crushing of non-metallic brittle materials with medium hardness of 50-80MPa. Widely used in steel, nonferrous metals, electricity, chemicals, building materials and other departments. 1. Unique patented technology guarantees high crushing ratio and low powder rate. 2, the crushing ratio is large, the strength is evenly adjustable, and can meet the required granularity. 3, super hard materials into the machine, can achieve electrical and mechanical dual self-protection. 4. The mechanical spring structure ensures the synchronous adjustment of the roller pitch. 5, the structure is simple, the body is compact and light, and the price is low.